The Jaguar XJ-S (later XJS), a luxury grand tourer, was produced by the British manufacturer Jaguar from 1975 to 1996. The XJ-S superseded the E-Type (also known as XK-E) in September 1975, and was based on the XJ saloon. It had been developed as the XK-F, though it was very different in character from its predecessor. Although it never had quite the same sporting image, the XJ-S was a competent grand tourer, and more aerodynamic than the E-Type. The last XJS was produced on 4 April 1996; by then 115,413 had been produced during a 21-year production life. The model was replaced by the XK8. The XJ-S was launched on 10 September 1975. The development, directed by William Heynes had begun in the late 1960s as project XJ27, with an initial shape set by Malcolm Sayer, but after his death in 1970 it was completed by the in-house Jaguar design team, headed by Doug Thorpe. Power came from the Jaguar V12 petrol engine with a choice of a manual or automatic transmission, but the manual was soon dropped as they were left over from V12 E Type production. V12 automobiles were unusual at the time; Italian luxury sports car makers Lamborghini and Ferrari produced such models. The specifications of the XJ-S compared well with both Italian cars; it was able to accelerate to 60 mph (97 km/h) in 7.6 seconds (automatic) and had a top speed of 143 mph (230 km/h). The first series of XJ-S cars had a BorgWarner Model 12 transmission with a cast-iron case and a bolt-on bell-housing. In 1977 GM Turbo-Hydramatic 400 transmissions were fitted. The TH400 transmission was an all-aluminium alloy case with an integrated non-detachable bell-housing. The XJ-S was originally supplied with Dunlop SP Super E205/70VR tyres on 15 × 6K alloy wheels; British police upgraded their Jaguars to a higher-performing 205/70VR15 Michelin XWX . Jaguar's manufacturing timing was not good; the car was launched in the wake of a fuel crisis, and the market for a 5.3-litre V12 grand tourer was very small. The styling was also criticised, including the buttresses behind the windows. German authorities feared these would restrict rearward vision, and refused to give the XJ-S, and the similarly adorned Lancia Montecarlo, type approval: it was for a time necessary instead for German XJS buyers to obtain road approval for each individual car when registering it. Such fears were ill-founded, since in reality the rear visibility was very reasonable, with only the frontmost top edges of the buttresses being visible when looking rearward. Jaguar did seize promotional opportunities with the television series The New Avengers and Return of the Saint. The New Avengers featured Mike Gambit (Gareth Hunt) who drove an XJ-S. Return of the Saint saw Simon Templar (played by Ian Ogilvy) driving an early XJ-S with the number plate "ST 1". Miniature toy versions were made by Corgi and proved popular. In the early 1960s, Jaguar had turned down the producers of the earlier Saint series when approached about the E-type; a Volvo P1800 had been used instead. Responding to criticisms that the XJ-S was not a worthy E-type successor, Pininfarina revealed a sporty show car in 1978 based on XJ-S mechanicals and called Jaguar XJSpider; it never went into production. From July 1981 the XJ-S became the XJ-S HE and received the new High-Efficiency engine for much better economy. With the Fire Ball combustion chamber designed by Swiss Engineer Michael May, as a by-product power was increased to 220 kW (295 hp) or 196 kW (263 hp) in North America. At the same time, the XJ-S HE received changes to its exterior and interior (body-coloured trunk plinth in place of the standard previous black, new five-spoke (starfish) alloy wheels, chrome inserts on the upper part of the bumpers, burled elm inserts on dashboard and door cappings). In 1982, the new V12 XJ-S HE won first and second at the RAC Tourist Trophy race at Silverstone. In 1983 the new 3.6-litre Jaguar AJ6 straight-six (I6) engine was introduced, and a new cabriolet version, the XJ-SC produced, with the coupé's rather small rear seats dropped, making it a 2-seat car. The XJ-SC was not a full convertible but had a non-removable centre targa-type structure and fixed cant rails above the doors. The rear quarter windows remained as well. The six-cylinder cars can be identified by a slightly raised "power bulge", running along the longitudinal centre section of the bonnet. Between 1983 and 1987 the six-cylinder-engined cars were only available with a five-speed manual transmission (Getrag 265), with a four-speed automatic (ZF 4HP22) offered from 1987 onwards (along with improved fuel injection as used on the XJ40). The earlier, manual models were not imported by Jaguar into the United States, which had to wait until the facelift manual 4-litre XJS coupé and convertible became available. A V12 powered XJ-SC was introduced in 1985. The two-seat XJ-SC targa-type model, never a great success in the marketplace, was replaced by a two-seat full convertible in 1988 which proved to be a great hit. Rear seats of a 1982 Jaguar XJ-S HE coupe, showing the 2+2 seating layout. Coach Builders limited converted XJS from coupe. It has 4 seats compared to factory convertible. The number produced is not known. From 1986 a full convertible version was available through some dealers, modified by Hess & Eisenhardt in the USA. The Hess & Eisenhardt coachbuilding firm was located in Ohio, USA, and built about 893 of these cars under contract from Jaguar before the official Jaguar-built XJS full convertible appeared in 1988. The Hess & Eisenhardt convertible differed from the later Jaguar convertible XJS as its unpadded top folded down deeper into the body structure of the car resulting in a cleaner rear profile when the roof was lowered. To accommodate this design element, the Hess & Eisenhardt convertibles have two separate fuel tanks, positioned to allow for the roof to fully retract. The process of converting the stock Jaguar XJS coupé into the H&E Convertible included the post-production removal of the roof, cutting the body in several sections, the addition of steel reinforcements behind the driver's seat, and 20 lb (9.1 kg) weights placed just behind the headlights to eliminate harmonic resonance caused by the significant modifications to the car. H&E XJS convertibles are easily identified by the lower folding top, as well as two small badges located just behind the front wheels. The later Jaguar full convertible had a heavier padded top that did not fold into as small a bundle when in the lowered position, but retained nearly all of the original components of the coupé. The number of H&E Jaguar XJS produced is unknown, partly because a fire at the Hess & Eisenhardt factory destroyed most of the records pertaining to the Jaguar XJS conversions. From 1988, a special high performance XJR-S version of the V12 5.3-litre car was produced by JaguarSport, a separate company owned 50:50 by Jaguar and TWR. This car had a distinctive body kit, special alloy wheels and suspension and handling improvements. The first 100 of these cars were termed "Celebration Le Mans" to commemorate Jaguar's 1988 win at Le Mans and only sold in the UK. Between 1988 and 1989 a total of 326 XJR-S cars were produced with the 5.3-litre engine. After September 1989 the change was made to a special 6.0-litre engine with Zytek fuel injection and engine management system, which had a top speed of 158 mph. This was different from the standard 6.0-litre engine used in the late XJS models. The XJR-S stayed in the line until 1993 with power raised at 338 PS (333 bhp; 249 kW) @ 5250 rpm and 495 N⋅m (365 lb⋅ft) @ 3650 rpm of torque ; a total of 787 coupes and 50 convertible cars were built for the world market. In the United States, to commemorate the spectacular XJ220 launch in 1992, a limited number of 100 XJRS coupes and convertibles were produced for the American market only. These included 22 Signal Red coupes, 22 Signal Red convertibles, 22 Jet Black coupes, 27 Jet Black convertibles, 2 Flamenco Red coupes, and the Silver Frost 'Press Cars' of 4 coupes and 1 convertible. Jaguar considered a luxury Daimler version tentatively called Daimler-S, without the buttresses. One prototype was made in 1986, but the vehicle was not put into production. Paul Banham did produce some custom notch back coupés without the buttresses, larger rear side windows, and a narrow C-pillar. In the mid-nineties, Banham also made a re-worked version called the XJSS based on the XJS. The car was re-launched in its final form in May 1991 and renamed XJS. The rear side windows appeared enlarged (although the body glass aperture was of identical size as the earlier car), and the buttresses stayed (although their appearance was minimised by the new side window treatment), as designer Geoff Lawson argued that they were part of the car's character. The car received a new 4.0-litre version of the AJ6. In 1992, a 4.0-litre convertible was added to the range. The V12's capacity was enlarged to 6.0 litres in May 1992 (227 kW (304 hp)). At the same time the car benefited from a revision to the rear brakes, they were now fitted with outboard rear disc brakes, instead of the more complicated inboard items on previous models. With the introduction of the 6.0-litre V12, the transmission was also updated to a GM 4L80E with a fourth-gear overdrive, whilst the automatic 4.0-litre models continued with the electronic ZF4HP24E transmission. A 2+2 convertible was also introduced, as was a customised insignia line. At the same time the car received more aerodynamic front and rear bumpers. The XJS was discontinued in 1996, after 21 years in production. It was replaced by the XK8. A number of XJS's were modified by coachbuilders Lynx to create a three-door shooting brake, marketed as the Lynx Eventer. Records suggest that 52 pre-facelift XJ-S, and 15 post-facelift XJS, were adapted, with 18 LHD and 49 RHD. For 1977, the "Group 44" racing team had a very successful season in Trans Am with a race car based on the actual production XJ-S chassis and running gear. The team won the series' 1977 drivers' championship cup for Bob Tullius but missed winning the manufacturer's title by two points (only one Jaguar was competing in the Trans-Am series compared to many more Porsche entrants). In 1978, a purpose-built tube-frame "silhouette" style XJS race car was constructed which greatly reduced the weight compared to the full production chassis car campaigned in 1977. This silhouette car had only the production car's roof panel as the sole piece of factory XJS sheetmetal on the car. Group 44 succeeded in again capturing the driver's championship for Bob Tullius and also captured the manufacturer's title as well, by entering Brian Fuerstenau driving the 1977 car at some venues to gain additional manufacturer's points for Jaguar. The silhouette car survived and has surfaced recently in the SVRA historic sports race series. The 1977 factory chassis race car is believed to still be in the hands of Group 44's Bob Tullius. In April 1979 a Jaguar XJS driven by Dave Heinz and Dave Yarborough was entered into Cannonball Baker Sea-To-Shining-Sea Memorial Trophy Dash, widely known simply as the Cannonball Run. They completed the 2,863 miles (4,608 km) from New York to Los Angeles in a record time of 32 hours and 51 minutes, a record that stood for 4 years, until it was beaten by David Diem and Doug Turner in a Ferrari 308. Diem and Turner covered the same distance in 32 hours and 7 minutes on the US Express, an unofficial successor to the Cannonball Run. In 1982 Tom Walkinshaw's TWR had entered a team of the V12 XJS' into the European Touring Car Championship, the cars built to the FIA's Group A touring car rules. The XJS won its first race that season when Walkinshaw and Chuck Nicholson won the XIV Grand Prix Brno, the Jags simply proving too fast for their rival BMW and Alfa Romeo opposition with Walkinshaw qualifying 5.37 seconds faster than anyone else on the 10.925 km (6.789 mi) Brno Circuit. After more victories for the teams Jaguars in 1983 (including lapping the 20.81 km (12.93 mi) Nurburgring Nordschleife circuit in 7:56.00), the TWR Jaguars were the cars to beat in the ETCC, with Walkinshaw claiming the 1984 ETCC Drivers' Championship. During the championship season the TWR Jaguar team also won the prestigious Spa 24 Hours race with an XJS driven by Walkinshaw, Hans Heyer and Win Percy, proving not only the speed of the cars, but the reliability of the 5.3 litre V12 engine. By 1984 the TWR Jaguars had a new challenger in the ETCC. The turbocharged Volvo 240T run by Eggenberger Motorsport arrived on the scene and had the speed to match the V12's, though with turbocharging new to touring car racing it took a number of races for reliability to match the cars speed. By the end of 1984, the TWR developed V12 engines in the XJS were producing approximately 450 bhp (336 kW; 456 PS). By 1985 the XJS had been retired from European competition and TWR was committed to running the 3.5L V8 Rover Vitesse in the ETCC. 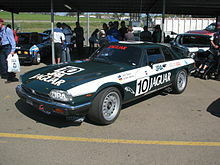 Walkinshaw had been to the 1984 James Hardie 1000 at the Mount Panorama Circuit in Bathurst, Australia, to co-drive a locally developed Australian Group C XJS with Aussie John Goss. Walkinshaw qualified the V12 Jag in provisional 7th place with a 2:16.09 lap of the 6.172 km (3.835 mi) circuit, recording 290 km/h (180 mph) on the 2 km long Conrod Straight, with the promise of more to come in the "Hardies Heroes" Top 10 runoff through the use of special tyres. However, the tyres failed to arrive at the circuit in time and Walkinshaw eventually qualified 10th having to use front wheels on the car as no suitable rubber was available. Clutch failure saw the car fail to get off the start line and a helpless Walkinshaw was hit from behind by a Chevrolet Camaro Z28, causing the car's instant retirement and the race's first ever restart after the track was blocked at the start/finish line. The Scot was determined to come back in 1985 and win the race in the first season of Group A in Australia and in 1985 the three TWR XJS Jaguars were brought out of retirement for the James-Hardie 1000. The cars were clearly the class of the field, finishing Hardies Heroes in 1st (Walkinshaw/Percy in #8), 2nd (Jeff Allam/Ron Dickson in #9) and 6th (Goss/Armin Hahne in #10). This time the cars got off the start line and Walkinshaw and Percy dominated most of the race, only losing the lead to the Goss/Hahne car during pit stops (the Allam/Dickson car went out on lap 3 with engine failure). The drivers of the #10 car, who had to battle a broken seat which was held loosely in place by straps and cable ties for well over 100 laps, sat in second most of the way until a split oil line late in the race cost the Walkinshaw/Percy car 3 laps and any chance of victory. 1974 Bathurst 1000 winner Goss won his second "Great Race" while Hahne, who had won the Group A category in the 1984 race driving a TWR Rover, maintained his 100% record with his only Bathurst 1000 win. After having the oil line replaced, Walkinshaw resumed in 4th place but easily caught and passed the JPS Team BMW 635 CSi of 1985 Australian Touring Car Champion Jim Richards in the last laps to make it a Jaguar 1–3, with Walkinshaw following Goss across the finish line in a formation finish. The TWR XJS Jaguars were next seen late in 1986 at the Fuji 500 in Japan in what was meant to be its Group A swansong as it ran out of FIA homologation in at the end of the year. Against old foes in the BMW 635 CSi and Volvo 240T, as well as newer Group A cars such as the Australian Holden VK Commodore SS Group A V8 and the turbocharged Nissan Skyline DR30 RS, Walkinshaw qualified the XJS on pole, proving how competitive the car could still be in Touring car racing (the cars had been entered in the 1986 Bathurst 1000 and had undergone testing and development which gave a reported extra 50 bhp (37 kW; 51 PS), though ultimately did not race due to a lack of money from Jaguar Rover Australia to help with freight costs). The Fuji race saw the Walkinshaw/Percy car lead the race until retiring on lap 6 with no oil pressure after easily holding off the 420 bhp (313 kW; 426 PS) Holden Commodore of Peter Brock on the circuits 1.5 km (0.93 mi) main straight, while the Hahne/Denny Hulme/Walkinshaw car only lasted until half distance before retiring with a broken differential. Despite not being eligible for Group A racing in 1987, TWR ran their two Jaguars in the 1987 (January) Nissan Mobil 500 in Wellington, New Zealand under special invitation from the race promoters. Neither car finished with Walkinshaw/Percy suffering diff failure and the Hahne/Hulme car cutting a tyre resulting in a race ending crash after fighting their way into the lead. The cars then raced at Pukekohe, with Percy/Hahne giving the big cat a second-place finish in its final race behind the Perkins Engineering Holden Commodore VK of Australian drivers Larry Perkins and David Parsons. Australian privateer Garry Willmington ran an XJS in the 1985 and 1986 Australian Touring Car Championships, and also the late season endurance races. While he reportedly had obtained more power from the V12 than TWR, Willmington didn't have TWR's resources to develop either the car or engine reliability and results were not forthcoming, though on occasions where the track had a long enough straight (such as Sandown Raceway in Melbourne or the Adelaide International Raceway), the Willmington Jag was usually the fastest car in a straight line. John Goss also ran his own privately entered XJS in the 1986 James Hardie 1000 after Jaguar-Rover Australia pulled its backing of the proposed TWR return to Bathurst due to a severe downturn in the Australian car market forced him to defend his crown alone, though he did receive some technical assistance from TWR. Electrical problems in the race saw Goss finish 24th with veteran Australian driver Bob Muir. Today the XJS continues to be extensively campaigned in club level motorsport both in the United Kingdom and overseas. Best known of the race series is probably the Jaguar Enthusiasts' Club XJS championship, currently in association with Toyo Tires. Their championship has now been running for over a decade, offering an affordable entry into club motorsport in the UK, and continuing to attract large grids of this unlikely racing car. Cars compete in various states of modification, from barely modified road cars through to full race-specification cars built in homage to the great TWR specials. ^ "Austin Rover Online". Austin-rover.co.uk. Archived from the original on 28 July 2012. Retrieved 30 September 2010. ^ All production figures according to: Brian Long: Jaguar XJ-S. Veloce Publishing, Dorchester 2004, ISBN 1-904788-20-3, p. 189. Note: figures are for calendar years and may slightly differ from actual totals for the various models.'. ^ a b c d "Jaguar XJ-S automatic". Autocar. 146. Vol. (nbr 4203). 28 May 1977. pp. 38–42. ^ Osborne, Donald (September 2012). "GT Sleepers for Monterey Week". Sports Car Market. 24 (9): 44–45. ISSN 1527-859X. ^ Paul Skilleter, Jaguar Sports Cars, pp.323 ISBN 0-85429-166-0. ^ "News: Jaguar rear view problems in Germany". Autocar. 144. Vol. (nbr 4138). 28 February 1976. p. 39. ^ Automobil Revue, catalogue 1982, p. 346. ^ "1992 Jaguar XJR-S 6.0". carfolio.com. Retrieved June 18, 2018. ^ a b Büschi, Hans-Ulrich, ed. (10 March 1994). Automobil Revue 1994 (in German and French). 89. Berne, Switzerland: Hallwag AG. p. 318. ISBN 3-444-00584-9. ^ "Alex Roy Reveals Transcontinental Run, Claims Record". Jalopnik.com. Retrieved 30 September 2010. ^ "1986 Japan Gr.A Inter TEC opening laps (Japanese commentary)". YouTube.com. 2008-01-31. Retrieved 2017-01-06. Long, Brian (2004). Jaguar XJ-S. Dorchester: Veloce Publishing. ISBN 1-904788-20-3. Wikimedia Commons has media related to Jaguar XJ-S. Text available under the Creative Commons Attribution-ShareAlike License; additional terms may apply.